In a city I have lived in for 30 years a transformation is occurring. It is at once obvious, in its massive demolition and construction, yet beyond my experience and understanding. It is easy to simply identify this change with a new sublime of global capital. I live and work between the Heygate and the Ayelsbury estates, near the Elephant and Castle, in London. I am an artist, using the city, my experience of it, to make work about how we construct our institutions, cultural and material, personal and collective, and embed them within the material fact of the city. London is at the moment a city in rapid change, where large-scale physiological and institutional disturbances are occurring. I find this confusion an ideal place to explore how new ideologies are constructed and emerge in our city and lives, how they might then explicitly and implicitly delineate the horizon of our future. While working with geographers Dr. Andrew Harris and Dr. Martine Drozdz, as artist in residence at UCL Urban Lab, I focused on making an artist’s film, Vertical Horizons. The film, based around the Shard, Western Europe’s tallest building, explores the spectacle of capital in the broader social, psychological and material ecology of the city. Vertical Horizons was made over three years, shot in a series of thirteen panning shots, from vantage points encircling the building itself, some from the ground level of the city, others from the banks of the river Thames. Each shot is the same speed and length and is edited into the next, forming a continuous 75 minute long slow panning shot to the left, accompanied by narration. The strict formal structure of the film draws attention to the framing of the image and passage of time, as the narration emphasizes the contingencies of the becoming of The Shard in the city. The narration and sound was recorded and musical score worked on with musician Steve Kidd, blending found sound with synthesized sound; music, echoing the shift in the narration and image between observation and reflection. It was first exhibited as an installation in ROOM Art Space, London, accompanied by a library of research material and a series of large format photographs 36 Views of the Shard, a homage to Hokusai’s images of Mount Fuji, and the new sublime of global capital. It is now screened regularly in film festivals, special screenings and discussions. My initial approach to the Shard was the particularities of it’s funding, quantified as a week of Qatar’s excess capital from fossil fuel revenue. My previous projects have looked at oil, energetic excess and modernity and I was interested whether the contingencies of the building’s funding might be expressed in its emergence in our city. A common assumption sees the Shard as an artifact of globalization, financializaton and the manifestation of a ‘capital reality’. This view of The Shard was soon put to the test, in an interview with Yolanda Barns, Saville’s Head of Global Research, who said ‘the Shard is less a product of global financial imperative than of nostalgic political will’. This confirmed one of our working hypothesis that this building was an object with more complex contingencies. In the political sphere, New Labour facilitated, both bureaucratically and financially, the Shard’s genesis, enabling planning consent and during a critical downturn using an early Transport for London tenancy to financially under-write the project. It appears less as a demonstration of financial imperative, than one of our need for civic institutions to be associated with edifices perceived as powerful and ‘pragmatic’. John Prescott, New Labour’s Deputy Prime Minister at the time said, “The Shard is a beacon that will show the world that London is open for business.” This move from financial functionality to an understanding of the project’s impact on the global spectacle of world cities, hints at the value of widening the scope of our study of the Shard. I am interested in how personal constructions of meaning are reflected in larger cultural institutions. This can be through a process of accommodating difference by the construction of otherness. Ideas that we imbue with the qualities of being true and real in ourselves, are in our culture, encoded in the collective solidification of this otherness, held by the construction of institutions. How do we imagine financializaton, globalization, how is that imagination used in our culture? How in turn do these institutions configure ourselves? As part of the film’s research I participated in a reflective practice group at No. 42 Psychotherapy Practice, located below the Shard in London Bridge. Following a presentation of Vertical Horizons, and a day of group discussion, one of the participants offered to theme the next session around the idea of ‘compensatory fantasy’, a construct created to compensate for injuries to our individual or collective egos. For example a popular interpretation of a tall tower like The Shard, would be a phallic ‘compensatory fantasy’, a huge tower to mitigate against feelings of impotence. Over the discussion we came to see the idea of compensatory fantasy more broadly as a tool, with many forms, that mitigate against our fears and uncertainties that we have difficulty facing more directly. These constructs are from the simplest small assumptions about everyday reality to cultural constructions of larger beliefs and institutions. We found great difficulty in articulating where the point is, between useful assumptions and beliefs in our common constructed reality and harmful delusions, ‘compensatory fantasies’. Stepping outside the frames of reference common to psychoanalysis, I recounted an interpretation of the Skyscraper index, that the world’s tallest buildings have risen on the eve of global economic collapse, a theory, that if not strictly correct has proved useful to articulate a similar shift. In the realm of economics, the construction of the next tallest building is an indicator of the state of mind of the broader market place. Skyscrapers are a form of real estate often associated with the ‘spatial fix’ of large market investment funds, due to their huge scale. In the Skyscraper Index the world’s tallest buildings are assumed to be indicators of the general orientation of the market, toward creating over investment in spectacular monuments rather than more directly ‘useful’ machines of production. By comparing these processes we can inform how we articulate this inflection point, between useful assumption/identification and compensatory fantasy, in ourselves as well as the larger culture. When the level of our investment in them compromises our ability to provide for our greater needs. For example when they are mistaken for ends in themselves rather than means to an end, our own wellbeing. Could the Shard be an artifact of a larger cultural compensatory fantasy? Could we understand the spectacle of financializaton as an entity onto which we project what we find difficult to hold ourselves, individually or collectively. Along the lines of our culture on the psychoanalyst’s couch, we can then ask what it is compensating for? What is it is that we cannot take responsibility for in ourselves such that we feel we have to cede to financializaton? Take, for instance, an over-investment in images of power and authority, The Shard, in times of uncertainty and insecurity. The Shard is a construction of a narrative that justifies these objects in our cities through a commonly used argument of financial necessity, where we invest in the ideas of globalization as incontrovertible, that we have no choice but to supplicate ourselves to, fear. My film investigates the construction of this narrative. I found that it is less an imposed other, foisted upon us by global financial necessity, than our need to imagine, to invest in authority outside of ourselves, that is an invitation to the creation of these objects in our midst. I began making a film about the Shard with an interest in how the material qualities of fossil fuels might manifest in the processes of capital, and how the processes of capital where manifest in the construction of our city. I finished Vertical Horizons with an appreciation of how capital, as a spectacle, is intimately connected with political, cultural and personal imaginaries. The Shard is an expression of nostalgic political belief and power structures as much as the processes of finance and the pursuit of profit. In other words, the Shard is an example of our need to imagine capital and how this imagination restructures our city, and through this spectacle, our expectations of the future, the horizon of our reality. 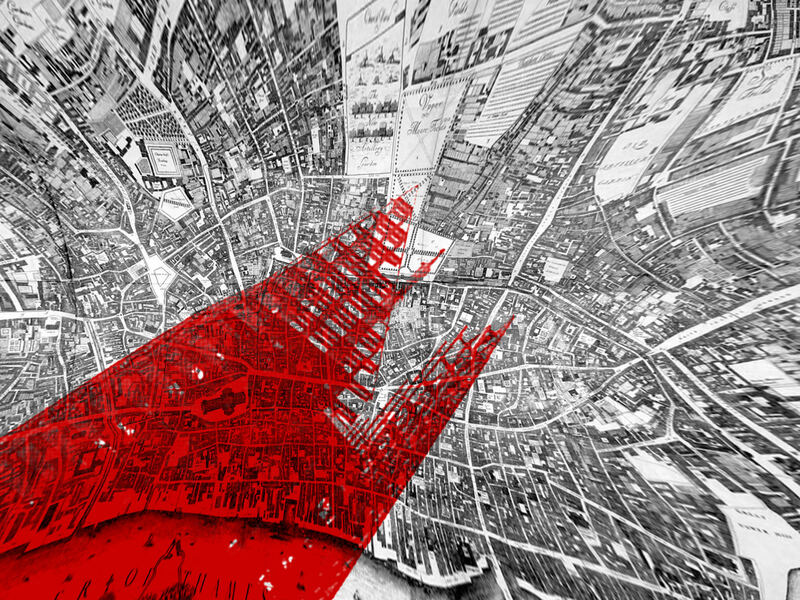 Two projects take this relationship between the spectacle and the process of the urban further. My next project is a film called The Walworth Road. The Walworth Road is chaotic, resilient high street that passes the Heygate and Aylsbury Estates, former social housing projects being redeveloped into global property portfolios. If Vertical Horizons looked at the contingencies of spectacle in our city, this film will look at how the large scale spectacular is constituted in the everyday normal of the high street. The second project, Castle of Hope, is the construction of a building and the documentation of the whole process of design through to actualization, which takes these ideas and engages directly with the institutions of the city. In collaboration with Chase Architects we will develop and build a two story building into a 6-12 story block of flats, while still keeping the original building. 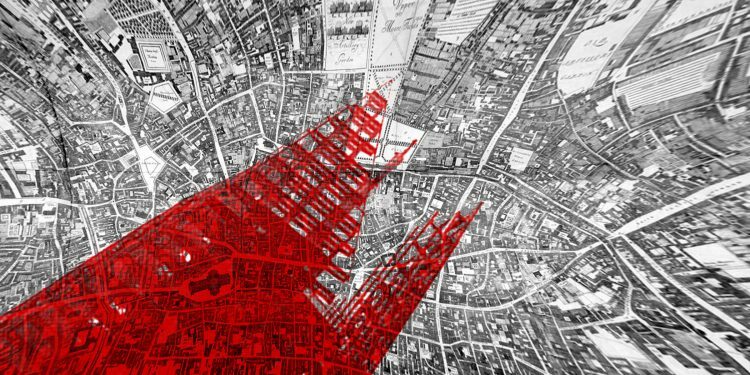 Rather than imposing a single monolithic edifice, we try and find a more ongoing, flexible and reflexive relationship with the multiple institutional layers of the city, the site, finance, planning, community, ownership and the material contingency of the building. Tom Wolseley is an artist. His latest film Vertical Horizons, is a meditative film about Western Europe’s tallest building, the Shard, exploring our tendencies to verticality in architecture, wealth distribution and identity in London. Tom was Leverhulme Artist in residence at the UCL urban Lab 2015-17. He has shown internationally for over 20 years, with his most recent work increasingly using film to explore the changing city in which he lives.